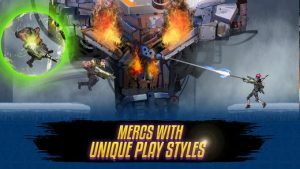 Mayhem is a furiously fun, crushingly competitive team-based multiplayer arena shooter that combines the visceral thrill of twitch-based action with cutting edge real-time PvP multiplayer. Assemble your squad of deadly mercs, master an arsenal of lethal weapons, and climb the ranks through action packed battles against players from around the world. NOTE – A network connection is required to play the game. Team up in 3v3 arena combat with friends in King of the Hill and Team Deathmatch game modes. Hang back and snipe or run-and-gun to make it up close and personal. Each merc has their own unique play-style. Rank up your mercs through skillful play to pwn some noobs. Tons of upgradeable mercs, abilities, and sentries add incredible depth to in-game strategy. The Mayhem never stops with new maps, new mercs, and special tournaments.